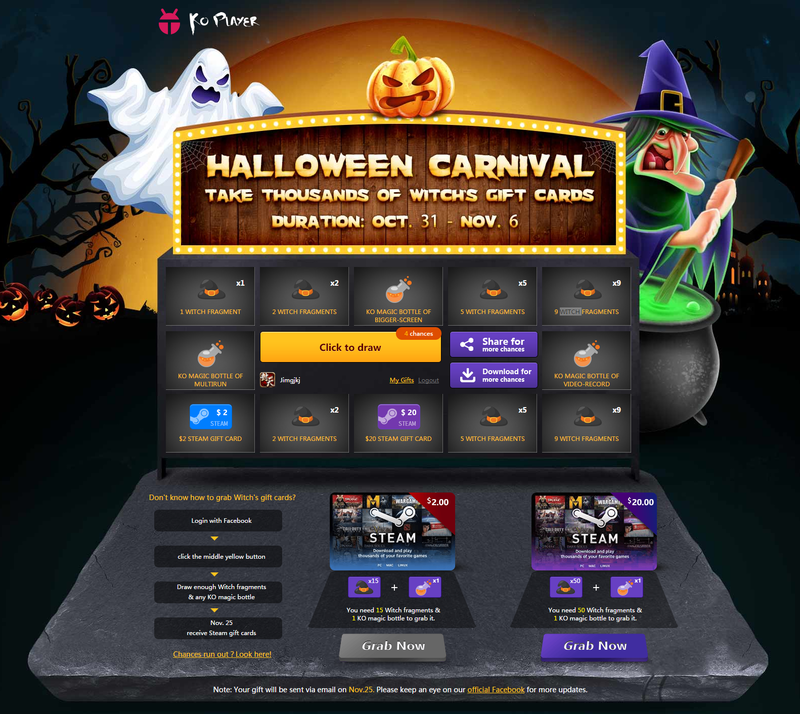 KOPLAYER Forum » KOPLAYER -- Android Emulator on PC (Windows/Mac) » Event » Halloween! Hello win!The lucky guy list in KOPLAYER carnival is here. Halloween! Hello win!The lucky guy list in KOPLAYER carnival is here. - Envy their luck. 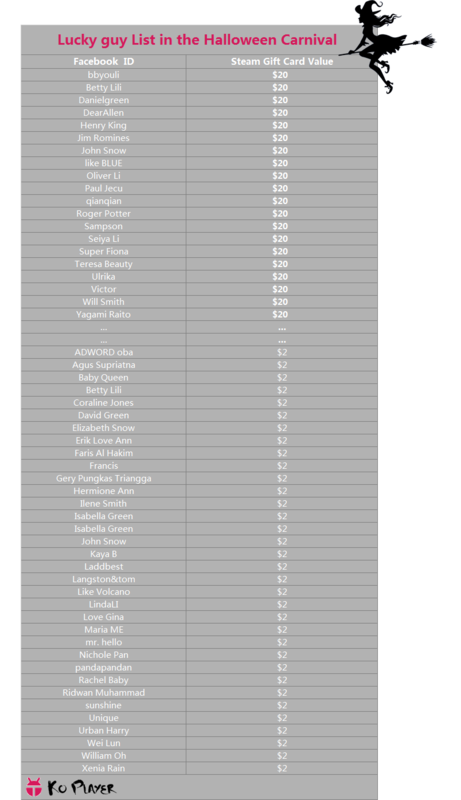 Dear all,here is part of the lucky guy list in KOPLAYER Halloween carnival! Everyone has known he or she got a gift and the list is so long,so here is just part of the list. This time 108 lucky players got the gift cards! Some ones even got 2 or more!Congratulations!!! The Steam gift cards will come to you on Nov.25th if you have successfully converted your gift and submitted your valid email on the event page. If you didn't get the gift this time,don't worry for there will be many chances to get gifts in KOPLAYER events in the future . KOPLAYER HALLOWEEN CARNIVAL HAS BEGUN! Will you be the luckiest one? The happy Halloween is coming! After taking part in a fancy ball,probably you want to be online to enjoy a simple but exciting game with thousands of gift cards! So KOPLAYER will hold such an online carnival for you! Let's beat the evil witch and grab all of her invaluable gift cards! Rule:Click to draw gifts including witch fragments, KO magic bottles and steam gift cards of different value.And if you finish 2 simple tasks with just 1 to 2 clicks,your chances drawing gifts will increase quickly beyond imagination. Here is a screenshot of the event. It will be bound to an unforgettable and unstoppable day in KOPLAYER! silverlapz Sunday, October 30, 2016 12:39:46 PM(UTC) | hhow to draw??? erbin Tuesday, November 08, 2016 9:13:37 AM(UTC) | LUCKY! 1 user thanked seikira for this useful post.